When an invitation arrives on your desk to come and drive the new 2017 Nissan GT-R, both across central Europe and then around legendary race track Circuit de Spa-Francorchamps, it doesn't really take a degree in rocket science to come to a decision. The Nissan GT-R is, simply put, a cult legend and an icon of the Japanese motor industry. Introduced in 2007 as a successor to the famous Nissan Skyline GT-R, the Nissan GT-R quickly won a die-hard following of loyal racing enthusiasts who were drawn to the vehicle thanks to its awesome speed and driving performance. The 2017 GT-R features a new "V-motion" front grille, which is enlarged for better airflow and cooling. As numerous versus tests revealed, including high-profile races on Fifth Gear, Top Gear and more, the GT-R was so fast that it didn't matter what prestigious, heritage-laden marque you threw at it - such as the Porsche 911 Turbo, Audi R8, Corvette C6 Z06 and BMW M3 to name but a few - the GT-R posted faster, more aggressive times. So now, almost 10 years down the line, Nissan have returned to this beast of a car with the unenviable job of improving it. Interestingly though, as I was soon to find out, how the Japanese auto manufacturer has gone about its work is quite different to what you might expect. This is not just a brash, loud game of number chasing, but a mature refinement geared toward lifestyle usage. The GT-R's new Y-spoke alloy wheels are lighter and stronger than before. However, while the new Nissan GT-R isn't just a number chase, let's now talk numbers. The 2017 Nissan GT-R has a twin-turbocharged 3.8-litre, 24-valve V6 engine that, after being bathed in cheetah blood, is now capable of delivering 570 PS (562 bhp) at 6,800 rpm. This 20 PS improvement comes courtesy of an increase in boost pressure and an ignition-timing system that's controlled at each individual cylinder, this latter tech previously the reserve of the insane GT-R NISMO edition only. The entrance toCircuit de Spa-Francorchamps, one of Europe's most famous race tracks. The increase in boost pressure and new ignition-timing system, the latter also helping to reduce engine knock, also means that the new GT-R boasts improved acceleration in the mid-range (3,200 rpm and up) and maximum torque available across a wider range of the vehicle's powerband. Rolled together, this grants the vehicle a blistering 0-60 time of 2.9 seconds, a top speed of 196 mph and an entry level price tag of £79,995. Ok, with the core numbers out of the way, let's talk about the major evolutionary changes Nissan has made to the 2017 model. Starting at the front of the vehicle the GT-R now sports a new matte chrome finish "V-motion" grille, which has been enlarged to increase airflow to cool the engine without causing any additional drag. The bonnet too has been redesigned, with structural integrity increased to deliver greatly improved aerodynamic performance at high speed, and the new front under spoiler has been slightly extended and lowered to improve airflow. Each GT-R comes with an engine hand-built by Nissan's "Takumi" master engine builders. Moving to the middle you'll find that the sill lip along the lower portions of the sides of the car has been reshaped to reduce the amount of air being drawn underneath. This has the effect of helping to counter vehicle lift at speed and improves stability. Also, in a really neat piece of engineering, the vehicle's C-pillars have also been redesigned entirely, with the upper portion now shaped to deliver better airflow management (it helps smooth out unwanted vortexs created to the rear). The interior of the 2017 GT-R features lots of Nappa leather and is a more mature space than before. At the rear small changes such as a silver-finish diffuser and new side air vents incorporated next to the quad titanium exhaust tips further help improve airflow, as too a redesigned rear bumper with NISMO styling. Oh, and lastly, the GT-R's new Y-spoke alloy wheels are lighter and stronger than before. Inside, things have changed markedly, with a far more luxurious, upscale and - crucially - everyday-use cabin. The new dashboard, for example, is wrapped in one continuous sheet of Nappa leather, while a new driver-orientated focus sees improvements like simplified dash button reductions (down to 11 from 27), more accessible navigation systems and an enlarged 8-inch touch screen. The GT-R's steering wheel has also been redesigned, with the paddle shifters now mounted directly to wheel rather than the steering column, making them more intuitive to operate. The overall result of these changes, from an aesthetic point of view, is a vehicle that looks more refined, mature and aggressive than ever. A new NISMO-styledrearbumper improves aerodynamics and grants a more aggressive aesthetic. And it's interesting that “refined” and “mature” are the words that springs to mind here, as I wouldn't really have associated them with the GT-R prior to driving from Düsseldorfin Germany down to Spa-Francorchamps in Belgium in the 2017 edition. However, that's what my gut reaction was - they've dressed the beast up in a tailored suit and sent it to get spiffy haircut. It's the same monster in terms of power and driving performance, but it now seems more grown up, smart and accessible than ever before. And, after listening to Hiroshi Tamura, Nissan's chief product specialist, talk about the 2017 GT-R, it is evident that this broadening of the GT-R's usage is something the production team was very keen on. Yes, for years the Nissan GT-R has had a reputation as a superb performance racer and track car, however now with the 2017 edition the Japanese auto maker has really gone a long way to make this a car which, while premium and high-powered, could be used everyday. Brembo® monoblock six-piston front and four-piston rear calipers help ensure rapid braking. Tamura spoke of the idea that the vehicle, ideally, becomes part of its owner's everyday life. The idea that after a long day at the office being shouted at by their boss, the owner still manages to get into their GT-R at clocking off time and have a pleasurable driving experience on the commute home. It's a good ideal to chase and, by and large, I think they've made some good strides in that direction. I was very comfortable driving the 150 kilometers from country to country in the GT-R, spending a few hours at the wheel across a variety of road types, and that definitely fits in with Tamura's vision for the car. However, whether I'd be as comfortable going on holiday in the new Nissan GT-R, spending say six to eight hours travelling in a day for multiple days, as I have done in the past, that is a different matter entirely. Without having actually spent that amount of time in the vehicle though it would be unfair to comment, however I'm guessing there are comfort limits to such a rigid, performance-orientated vehicle. The GT-R's engine features plasma-sprayed bores for reduced friction and superior power. 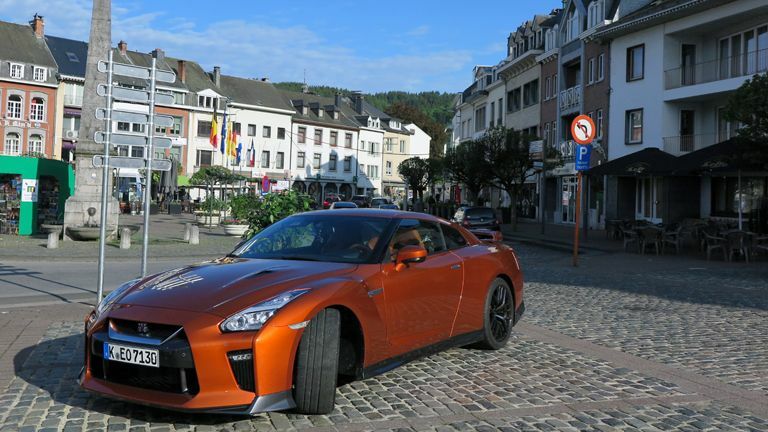 And, talking about performance, back in its native habitat, gunning it around Circuit de Spa-Francorchamps, the GT-R was just brutally brilliant. The kick, the noise, the you're-going-so-fast-your-eyes-water sensation was just ludicrously fun and on such a long, varied and demanding track, you really felt you could open the tank, brake late and drive on a totally different level than if you were in many other similarly-priced vehicles. No, make no mistake about it, the 2017 GT-R is an amazing car. Every single engine is hand-built by Nissan's “Takumi” masters - chaps who have decades of experience in building engines - it has some of most high-level and smart aerodynamic engineering currently on the market, and - most importantly of all - it excels in putting a smile on your face. The 2017 edition also makes great strides in making the car more life-orientated and after testing it pretty thoroughly over a couple of days, I genuinely feel it chases that ideal successfully. A jet fighter of a car that offers more off track than ever before. In the UK the 2017 Nissan GT-R is available in three different models: Pure, Recaro and Prestige, with a fourth NISMO edition to be offered in the near future. For more information about the new Nissan GT-R then you can check out its official website.